Movies, television series, and childrens' cartoons are important in many cultures, but in Egypt, they have been traditionally used as socialization agents, inculcating the population with pan-Arab and Egyptian nationalist themes as a counterweight to the infiltration of Western values and ideals. Islamists have also discovered the importance of the moving image for the battle of ideas, and they have increasingly used this medium to create an Islamic "counter-history" to the narrative presented by Egyptian popular culture. Through movies and TV series in historical genres, aimed at both children and adults, this counter-historical narrative has sought to redress the allegedly false and hostile depiction of Islam and show the faith's shining face before it was blemished by "hostile elements": Western Orientalists and Arab liberals. During most of the twentieth century, Egyptian moviemakers and government representatives expressed their historical and philosophical ideologies visually. Dozens of films were made that expressed the historical narrative of the Egyptian regime while Islamists rejected altogether the use of cinema and all its culture. All concepts of cinema stardom and fan adoration (e.g., the frequent marriages and divorces of cinema stars) were regarded as anathema to religious teachings, and Islamist circles disapproved of the content of Egyptian films, including love affair stories, popular depictions of belly dancing, and even alcohol consumption. As a result, there was a clear-cut distinction between the media used by Islamists and their rivals. Islamists made an efficient and massive use of audio cassettes and CDs, which continues to date. One can still see in Cairo and in other Arab cities big religious-materials shops selling audio cassettes that contain sermons and lessons by various preachers, such as the late Sheikh Abd al-Hamid Kishk, who was immensely popular and who still has eager listeners. Islamists have made efficient use of audio cassettes and CDs. Religious-materials shops in Cairo still sell audio cassettes by various preachers, such as the late Sheikh Abd al-Hamid Kishk (above). As the twentieth century neared its end, Islamists began using previously resented audiovisual media. one level, this was a struggle about the ethos and legitimacy of knowledge, particularly, the agents or vehicles of memory. Religious circles sought to maintain the sole legitimacy of the memory agents that were in use since the dawn of Islam: the written word and oral preaching, whether in the mosque at Friday prayers or through a sermon on audio cassette. Islamist circles even made efforts to use the old memory agents to attack the new audiovisual ones. In one of his recorded sermons, Sheikh Kishk sarcastically attacked public adoration of the actor Imad Hamdi (1909-84), enshrined by the state apparatus, including Egyptian TV, as one of the nation's historical heroes. For their part, the Egyptian regime and liberal groups fought radical Islam using the cinema and television series. In fact, liberal elements did their utmost to help the regime in the struggle against Islamist terrorists, often mocked in Egyptian films as ignorant of Islam, bloodthirsty, and egoistic. It is difficult to find a popular film in the 1990s and 2000s by the big stars of Egyptian cinema (such as actors Adel Imam and Nur ash-Sharif, or director Sharif Arafa) that does not contain a disparaging caricature of an Islamist terrorist. 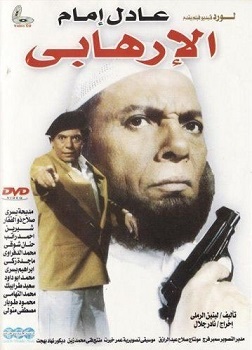 The Terrorist is a popular 1994 Egyptian film starring Adel Emam. It is difficult to find a popular film in the 1990s and 2000s by the big stars of Egyptian cinema that does not contain a disparaging caricature of an Islamist terrorist. The use of Egyptian cinema, and especially the medieval genre, to fight radical Islam is as old as the medium itself. The film Salama (1945, director: Togo Mizrahi) casts the venerated singer Umm Kulthum as a singer in the Umayyad period. One sheikh at the mosque condemns singing, but old people answer that they had seen the prophet's companions listening to songs. The extremist sheikh is modeled on modern fundamentalists, but the film finds an older and thus better source of authority: the first generation of Islam, closest to divine revelation, already defined by the Prophet Muhammad as the best generation ever. As the twentieth century neared its end, Islamists discovered that they could not compete with liberals by using only audio cassettes or written texts, basically media that describe history merely through verbal accounts. Islamist circles have thus begun using previously resented audiovisual media. The main advantage is the ability to take the viewer "into the story" through reenactment of a historical narrative or event. Islamists were also encouraged to use audiovisual media because many viewers uncritically regard what takes place on screen as what actually happened. Educational systems often provide tools to assess written texts but do not teach how to critique audiovisual materials. Therefore, audiovisual media are often taken at face value. One example is an Islamist Egyptian series dedicated to the great medieval theologian Imam al-Bukhari (810-70), included within a longer series called Aemat al-Huda (Imams who followed the right path), which gives an Islamist view of the "history of Islam in a nutshell." To ensure that viewers do not overlook the series' polemical "counter-narrative," it starts not in medieval Bukhara but in modern-day Cairo where Dr. Murtadha, a liberal intellectual journalist, has just published an article that calls for a revision in Bukhari's canonical hadith collection. The journalist is a caricature of a modern, liberal intellectual who knows very little about Islam (probably from secondary and Western-influenced sources) but is eager to attack Islam and demand far-reaching reforms. A man named Hussein rushes into Murtadha's office and reproaches him for his ignorant and dangerous article, then tells the story of Imam Bukhari. At that moment, the scene shifts to the theologian's childhood in Bukhara where he is reading a book he will remember forever. As he grows up, Bukhari decides to take upon himself the mission of collecting the reliable hadiths. And, as we learn, the false hadiths were invented by the dissenting Kharijite sect and by Shiites and not by Sunni Muslims. Bukhari, besides his unfailing memory, also has scientific methods to collect and classify hadiths. Presuming that each hadith passed from every generation to at least three people in the next generation, he has to locate at least twenty-seven chains of transmission to each hadith from "Tabi at-Tabiin" (namely, two generations after the prophet and his companions). To do so, Bukhari travels for sixteen years across the Muslim world, always taking the highest standards for accepting hadiths: "I will exclude any hadith for the slightest doubt. I will never accept a hadith from two people who were at the same place—maybe they have fabricated it together?" For example, Bukhari takes a long journey to collect hadiths from a person, only to refuse interviewing him after he was found abusing a donkey. Bukhari overcomes the envy of his rival, Sheikh adh-Dhuhli, and also faces an impossible test organized by the caliph: Ten men recount ten hadiths each, in which the content and chain of transmission were switched. Bukhari listens and immediately correctly reorganizes all one hundred hadiths before an astonished public. Finally, after sixteen years of work, Bukhari's "Sahih" is warmly welcomed as the "most reliable book" by Ahmad Ibn Hanbal (a hero of modern Islamists and a prominent figure in the series), and by all other Muslim scholars. This dramatic retelling of a scholar's journey was only the prelude to further mini-series in Aemat al-Huda. The others deal with Muslim scholars whose figures were allegedly distorted by elements hostile to Islam. In the popular cinematic epic Saladin, produced under the Nasser regime, leaders loyal to their Arab and Egyptian identity are victorious over foreign enemies. Islam is secondary to the secular. The series has strong religious attributes: There is no romance or belly dancing. Almost no women appear on the screen. There are no movie stars and no instrumental music (just an all-male chorus at the opening, chanting an anthem praising these Muslim scholars). The production is also quite poor: Most of the filming is indoors with many close-ups of the protagonist's face. The spoken language is modern standard Arabic and only the conversations in the Cairo office between Hussein and Murtadha are in colloquial Egyptian Arabic. Long religious sermons and teachings are interspersed, combining religious values with "legitimate" entertainment. This series proliferated on discs, usually in video-CD format that can be copied easily and can be played on old computers and even PlayStation consoles. They are sold in Islamic shops, and today can be seen online or be downloaded. These channels enabled Islamists to override state control and censorship and to send their messages directly to the masses. 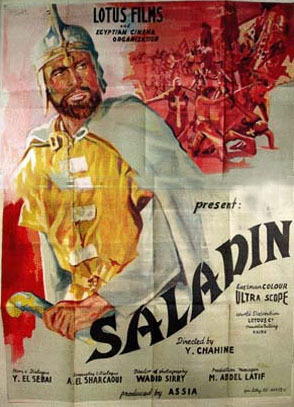 Egyptian historical cinema favors stories about Muslims fighting the Crusades and Mongolian invaders as vividly illustrated by the popular cinematic epics Saladin (1963, dir. Youssef Chahine) and Wa-Islama (1961, dir. Enrico Bomba and Andrew Marton). Produced under the Nasser regime, the two movies depict victory over foreign enemies as an achievement of great leaders, unifying the people behind them, and loyal to their Arab and Egyptian identity. Islam is secondary to the secular. The creators of Aemat al-Huda could not leave the formative medieval period without giving their own Islamic perspective by moving religious Islamic scholars, and Islam in general, from the margins to the center of the historical narrative. The series gives an especially central role to two prominent theologians, al-Izz Ibn Abd as-Salam (1181-1262) and Ibn Taymiyya (1263-1328). The Islamic series shows Ibn Abd as-Salam in a long struggle with both the Damascus ruler who neglected the laws of Islam and hypocritical Islamic scholars, who manage to deprive him of the right to issue fatwas. Surprisingly, Ibn Abd as-Salam is quite content to be released from this duty, and when in his dying moment, the ruler asks for forgiveness, Ibn Abd as-Salam answers that he forgives everyone every night. This kind of quietism is prominent in Aemat al-Huda where the protagonist ulema do not use force against the unjust orders of the ruler. It also hints that the series echoes the views of circles close to al-Azhar, widely regarded as the world's most prestigious Islamic institution of learning, and perhaps also the Egyptian Muslim Brotherhood, which at the time eschewed terrorism and violence as political tools, focusing instead on preaching, teaching, and helping the poor (da'wa) in order to build public support, in anticipation of the ripening of conditions for the eventual takeover of power. Yet this quietism has its limits. Having fled to Egypt, where he used his regained religious preeminence to insist that all matters be run according to strict Islamic law, Ibn Abd as-Salam refuses to accept Shagarat al-Durr as rightful ruler upon the death of her husband. He calls for jihad, organizes volunteers and money contributions, and even goes out personally to the battlefield in what heralds the end of the Ayyubid dynasty and the rise of the Mamluk era of slave kings. In his last days, he voices sorrow for dying in bed and not as a martyr during jihad. Hardly a quietist outlook. Ibn Abd as-Salam also uses his jurisprudential prowess to legitimize the reign of the Mamluks by declaring them "public slaves" who are bought in a "public auction" and set free right away. The Mamluk period is central to the general historical narrative in Egypt with many films presenting them in mostly negative terms. But in this series, viewers are given the ideal "Islamic solution" to the matter. This positive attitude is not difficult to understand given that the Mamluks defeated the Mongol invasion in the famous battle of Ain Jalut (September 1260), to which Islamists seek to give a religious meaning. 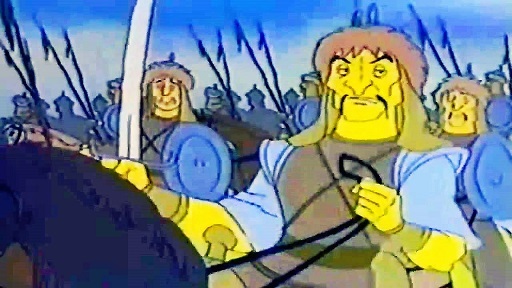 Consider, for example, the popular Egyptian children's cartoon series The Lion of Ain Jalut (1998, by Osama Khalifa) offering an "Islamic response" to Marton's Wa-Islama film by following its narrative line as two young descendants of the royal dynasty in the eastern sultanate of Khwarizm play a central role in defeating the Mongols in Ain Jalut. Unlike Wa-Islama, which presented Mamluk rule to generations of viewers as incessant bloodshed within the Egyptian ruling circles, The Lion of Ain Jalut depicts this period as one of "Islamic harmony" among Muslims with belligerent interactions among Wa-Islama characters (and in historical reality) transformed into affable ones. All characters in the Muslim camp, including female sultan al-Durr, are good friends. The Mamluks defeated the Mongol invasion in the famous battle of Ain Jalut, to which Islamists give a religious meaning. Many Egyptian films present the Mamluk period in terms of incessant bloodshed, but the Islamist children's cartoon series, The Lion of Ain Jalut (image above), depicts this period as one of "Islamic harmony" among Muslims. This emphasis on intra-Muslim accord follows a basic tenet in Islamist discourse, which accuses liberals and anti-Islamists of deliberate distortion of Islamic history by overemphasizing infighting among Muslims in order to "turn Islamic history into nothing but lakes of blood," as explained openly in the Aemat al-Huda series. This grievance was widely voiced by Egyptian Islamists in the late 1970s when they could express themselves relatively freely under Anwar Sadat's more tolerant regime, especially in criticism of the emphasis in state curricula on intra-Muslim confrontations and wars. However, at that time, it was solely expressed through the written or spoken word, hence the pioneering nature of the series' transference of this idea to the audiovisual sphere. Who stopped the Mongols, who destroyed the civilization? Not Aristotle, but Qutuz and Baibars, and in front of them Ibn Taymiyya. Baghdad was not helped by translations of Greek philosophy nor by the music. Not Pharaonic, Phoenician, and Arab nationalism helped, but Islam. It is clear that some episodes in Aemat al-Huda and The Lion of Ain Jalut were created as an "Islamic answer" to the audiovisual representations of the outlook in such movies as Saladin and Wa-Islama. Ibn Taymiyya's fatwa against Muslim rulers failing to fully implement Islam makes him the hero and even mentor of modern Islamists, who usually define Arab rulers as apostates, primarily since modern states are still run according to civic laws, usually based on European ideas. Ibn Taymiyya was the prominent medieval scholar who proclaimed the head of state an apostate even if he declares himself Muslim, unless the Shari'a is fully implemented. This implementation has not happened in most Arab states, making theirregimes targets for a wide range of Islamist movements, from the Muslim Brotherhood to al-Qaeda, who take their cue from Ibn Taymiyya, making him the "link" in the passage of modern Islamist groups from quietist anticipation to the next phase of violent action. Thus, for example, the teachings and rulings of Ibn Taymiyya were central for the group that assassinated Egyptian president Sadat in October 1981. 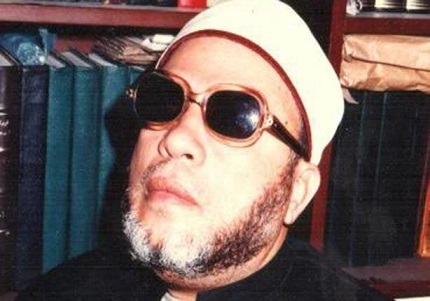 The teachings of Ibn Taymiyya, who issued a fatwa against Muslim rulers who do not implement Shari'a, were central for the group that assassinated Egyptian president Anwar Sadat in October 1981. Khalid Ahmad Shawky al-Islambouli (with raised finger), an Egyptian army officer, planned and participated in the assassination. The series about Ibn Taymiyya begins with the journalist Dr. Murtadha, who agrees that the image of many Islamic figures was deliberately mutilated and falsified, but who still thinks that Ibn Taymiyya was an "extremist." As usual, Murtadha knows nothing. As the scene shifts back in time, Ibn Taymiyya is sent as a child to the Imam an-Nawawi to study. Nawawi praises the Arabic language and proclaims that there are no foreign idioms in the Qur'an, a clear message against the introduction of foreign and Western knowledge and methods into the holy book's study. Muslims should continue to interpret it only according to the traditional way without the help of modern philology, which has found many foreign idioms in the Qur'an. Ibn Taymiyya's father also warns his son against philosophy, which he says brings good Muslims to heresy. During the series, many evil and hypocritical religious figures conspire against Ibn Taymiyya, usually because they are stooges of the Mongol enemy. Ibn Taymiyya preaches for jihad against the Mongols, although they had converted to Islam, because they do not accept all of its commands and refuse to implement Islamic law fully. He even goes to meet the Mongol sultan Qazan and reproaches him for invading a Muslim land. Ibn Taymiyya demands that prisoners, as well as Christians and Jews, be freed, the latter since they are dhimmis under the protection of Islam, and "we cannot leave them." The Mongol sultan agrees. Here the series creators indicate that Islamism is not hostile to Christians and Jews, but that the best conditions for them to coexist are actually under strict Islamic rule. It also indicates a message of tolerance to Christian minorities. The Mongol sultan Qazan, now Mahmoud, sends gifts and greetings to Egypt while planning another attack on Damascus, breaking his promises to Ibn Taymiyya. His conversion to Islam was only a formality, an empty political ploy, and he continues drinking wine from golden glasses. But Ibn Taymiyya persuades the Egyptian sultan Qalaun to help unify the Muslims against the Mongol invasion. Before the battle, Ibn Taymiyya preaches to the soldiers about the importance of jihad. The camera has him stand head and shoulder above the soldiers wearing a sword and a shield, making the scene appear to viewers as one of jihad warriors following Ibn Taymiyya's teachings. The renowned scholar participates in the battle and actually fights more bravely than the soldiers. Ibn Taymiyya then refuses to flee and is jailed where he reminds his brethren about the Qur'anic Yusuf (the Islamic version of the biblical Joseph), Said Ibn Jubair, and Ahmad Ibn Hanbal, who were also jailed by unjust rulers. This is another example of quietism. The series' protagonists wage wars against foreign invaders like the Mongols, but not against Muslim rulers who may jail good Muslims in medieval times—as today. But the series is not above criticizing other Muslims as when Ibn Taymiyya sees ecstatic dancing in a mawlid (festival commemorating the birthday of the prophet or a saint) and defines it as bid'a (a blameworthy innovation). This is a stand against the Sufi version of Islam and the popular cult of saints. The episode about Said Ibn Jubair is the seventh in another series by the Aemat al-Huda creators, the Rihana and Calipha companies, titled Great Figures in History—Biographies of a Selected Group from the Ulema of the Nation. These companies produced different mini-series under different names, usually with the same actors and similar narrative lines combined with the same ideological and artistic methods and aims. Ibn Jubair, in this series, represents boundless quietism as he faces the tyranny and blood thirst of the infamous governor of Iraq al-Hajjaj Ibn Yusuf (661-714), who gained notoriety for proclaiming: "I see heads before me that are ripe and ready for plucking, and I am the one to pluck them!" Ibn Jubair refuses to escape, leaving his fate in God's hands. When the guard offers him escape, he declines lest he be responsible for the punishment that the guard might suffer from Hajjaj. The episode ends with Ibn Jubair executed by Hajjaj, who soon receives his proper punishment from heaven and dies. The quietist, Islamist message conveyed here is that despite the immense power of the ruler do not resort to violence. Trust in God and wait patiently for better conditions. Epitomizing the struggle between noble Muslim values and the vicious and ruthless power of tyranny, the juxtaposition of Ibn Jubair with Hajjaj is the axis of another play by the prominent Islamist Sheikh Yusuf al-Qaradawi, A Scholar and a Tyrant: Said Ibn Jubair and Hajjaj Ibn Yusuf. In this play, Hajjaj symbolizes the tyranny of rulers across all generations and their refusal to accept the teaching of Islam or independent ulema. 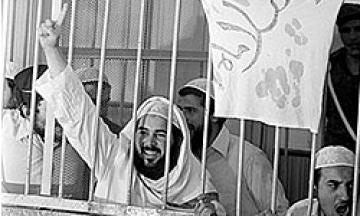 Qaradawi wrote his play while a prisoner of Nasser's regime alongside Islamist comrades. The contemporary relevance of the play is clear. Islamists, in a similar way to other religious fundamentalists, initially rejected motion pictures and the surrounding culture of cinema. But after a delay of more than fifty years they found that they, too, could use the unique power of the audiovisual, historical genre for their own narratives, creating their own visual "historiosophy" or theology of history. These television series give us a glimpse into the historical concepts of Egyptian Islamist groups at the moment they first used audiovisual technology. The Islam shown in these series is conservative, strict, highly learned, but not violent, and is probably close to the Muslim Brotherhood at their most restrained moments as well as many in al-Azhar circles. This is the Islamist answer and counter-image to that propagated by popular Egyptian cinema, which portrayed Islamists as bloodthirsty ignoramuses. Gilles Kepel, Le prophète et pharaon: aux sources des mouvements islamistes (Paris: Éditions du Seuil, 1993), pp. 185-205. Lila Abu-Lughod, "Local Contexts of Islamism in Popular Media," ISIM Paper 6, University of Amsterdam, Leiden, Dec. 17, 2004. See, for example, As-Safara fi-l-Imara, directed by Amr Arafa, 2005; Dam al-Ghazal directed by Muhammad Yasin, 2005. Muhammad Ibn Ismail al-Bukhari, Al-Jami as-Sahih al-Mukhtasar, 3rd ed., vol. 2 (Beirut: Dar Ibn Kathir, 1987), p. 938, hadith no. 2508. Kepel, Le prophète et pharaon, pp. 109-37. Al-Da'wa (Cairo), Mar. 1978, Apr. 1978. Carl B. Lombardi and Nathan J. Brown, "Do Constitutions Requiring Adherence to Shari'a Threaten Human Rights? How Egypt's Constitutional Court Reconciles Islamic Law with the Liberal Rule of Law," American University International Law Review, 3 (2006): 379-435. Kepel, Le prophète et pharaon, pp. 207, 229. Thabit Abdullah, A Short History of Iraq: From 636 to the Present (London: Pearson Education, 2003), p. 15.